Yesterday was the annual meeting of shareholders of Apple and has coincided with another fall in the value of shares: 1%, remaining at $ 444.29 ($ 441.40 as you see now). Since September, whose value peaked, the shares of the company on the block have fallen almost 35% and investors are biting, appearing annoyed by this constant decline in value. In fact, David Einhorn, hedge fund manager of Greenlight Capital and one of the largest investors of Apple, has again comment that should distribute more dividends to investors. Einhorn, who won a demanad filed against the company that began to press for this issue, has spoken out among multiple complaints to be heard: Apple will want to know how to fix the situation. 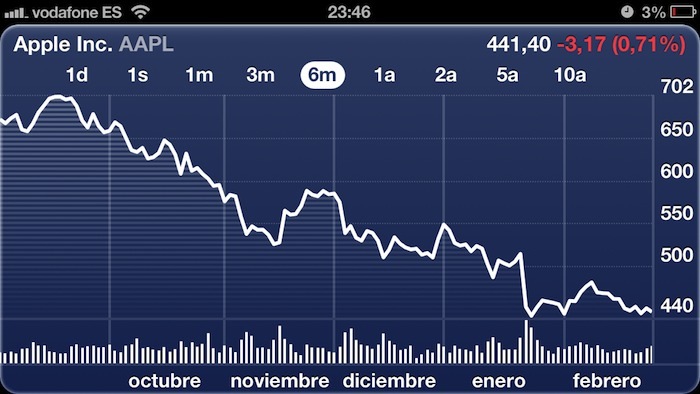 We discussed that Apple had made ​​a distribution in mid-February , when Einhorn curiously won the lawsuit. Although not yet have all the data of the meeting, the discomfort is palpable. Tim Cook, meanwhile, has come out after these statements and has said he is also upset with the falling value of the shares of Apple. He, the policy and the government team. Clearly, Cook is the first concerned that Apple values ​​stabilize or, much better, grow up, but, what steps will you take to it? The company is focused on long-term work and do the best you can. There are great things to come. With Samsung and other companies on the heels, Apple has put the batteries, but if it is true that they have "great stuff", says Cook, in the oven, we are convinced that the actions will stabilize soon. But all this will open season with new questions and doubts: a revolutionary device will soon? How much time is left to the iPhone franchise as we know it? Apple fans are looking forward to see turned into reality the words of Tim Cook!